With that in mind, and assuming you only have the items listed in this series, there are now really only a few crucial elements missing from your Tau Cadre: more railguns via broadside battlesuits, improved markerlight support via pathfinders, and more mobility and increased protection for your troops and pathfinders via armored transports (and maybe more troops, you can never have too many fire warriors). Pricey, but worth it. They can fire twin-linked strength 8 railgun blasts at air or ground targets up to five feet away. And now they can be kitted out with either rail guns or high-yield missile batteries and seeker missiles --wow! That's some serious missile spam. They have changed a bit since the last edition -for better or for worse, but broadsides are still one of the signature Tau units, and they're still the bad-asses of your cadre. Start off with two, then when the pain in your wallet subsides a bit, get another one or two if you can manage it. But remember, two of these with HYMP, SMS, seeker missiles and missile drones can pump out 24 shots and two seekers in a single turn (plus some twin-linking). And marker light support make more of those shots actually hit. 16 of those are strength 7, --be sure to check specific strength levels and potential save stripping shenanigans in the codex or tactica, but that's still nothing to sneeze at. I've said it before and I'll say it again, Tau make it rain. These are best run in pairs or maybe threes, or maybe even two units of two. But that's $200... just pace yourself. Yes, you will need these guys for their markerlights. Obviously markerlights can be found elsewhere, but I think Pathfinders provide the best bang for your buck. 10 guys returning an average of 5 hits per turn is a very good thing. An enemy unit with five markerlight hits on it not only loses its cover save, it also allows up to three units to bump up to their ballistic skill when firing on it. Take their drones and you get some other nice buffs as well. Take at least one unit for a base cost of 110 points. Though you may also want to add one more unit, they are definitely worth it. Unfortunately, to add pathfinders you have to drop either the drone squadron or the piranhas (drop the drones) because you only have three FOC slots for Fast Attack units. Don't throw the drones away, though. You can attach them to battlesuits or form their units up again when you get high enough in points use a double FOC. And keep all the bits. Games Workshop does not sell marker drones except for the one you get in the Stealth suit box and one in the Pathfinders kit. 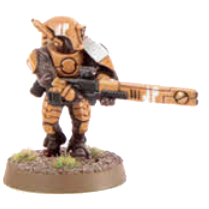 If you model a couple of the pathfinders with the rail rifles or the ion rifles (and you should) then you should have a couple of markerlights left over. Use them with the now obsolete external target lock or multi-tracker to make your own marker drones. Fire warriors and pathfinders can still be a little squishy if left out in the open. They have armor saves (at least technically) but are not immune to instant death. Put these softer units in a suit of AV 12 armor, namely a devilfish. This transport can protect them until needed or get them across the battlefield or to claim or contest objectives without becoming bullet-ridden blue corpses too early to do anything. As an alternative, and since you will eventually need them anyway, buy another hammerhead/skyray. you can use just the body for a devilfish, and plug in the turrets when you want another tank. Again, that's a pricey way to go, but it is an option. There are games when I do not even use the devilfish, I just spam with tanks. In one game I had six hammerheads (at 2000 points you can double your FOC). Be sure to check out our Devilfish Tactica. So that's the three big things that you need to have a strong Tau core. Well, maybe four things. You will definitely need more troops. If you only take two units of 12, you are asking not to win the larger games. Troops are necessary to claim objectives, and claiming objectives is the key to winning the game. One unit of fire warriors dies and you are only able to maybe claim one objective... not a winning strategy. Add another unit of fire warriors, or two, and another transport. Heck, you may even want to take a walk on the wild side and add some Kroot, but we will talk about them in the next phase. You can have up to six units of troops in your Cadre, and transports do not count against your FOC (though they do cost points). 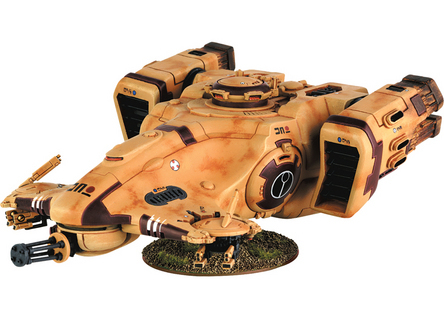 Ok, that gets you started, you have the signature and necessary units to field a viable Tau army. But this is where opinions diverge as to what to buy next, even in my own head. In fact, anything from this point is merely personal preference and based on units I like to play (for fun, not competitively). This is where your play style will matter more than my opinion. That said, I am going to give my opinion anyway. I believe that from here there are essentially two basic organizational philosophies or directions you can follow, Mech Tau and Gunline Tau. A third type of army build is Commander Farsight's All-Battlesuit army. I will post a plan you can follow for acquiring the necessary forces to make that happen as well. Oh, and one more thing I would recommend (and thanks Chip for bringing it up). If your gaming budget is as tight as mine, use a proxy to playtest the more expensive models before you rush out and buy them. 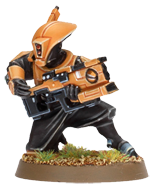 A proxy is an item that you can use to represent the model you wish to add to your army without the expense. That way you will know if $85 for that second riptide is a model you will absolutely need, or ever actually use, or not. Just use the correct base size and find a way to represent its height for line of sight and other targeting and measurement purposes. And be sure to let your opponent know what you are doing before the game is set up. If you like how it works with your play style, then buy it. If not, skip it. My recommendations are just that, recommendations. Stay tuned, Part IV is about a week out. Just noticed, there is also a markerlight drone on the Broadside sprue, so you actually have three sources to get them (one at a time). "it also allows up to three units to bump up to their ballistic skill when firing on it." I am wondering if your interpretation is accurate, the book reads: "All models firing at the target as part of this shooting attack gain a bonus to their ballistic skill for the duration of the shooting attack." I would take this to mean that all tau shooting at the target get their BS boosted, am I wrong here?